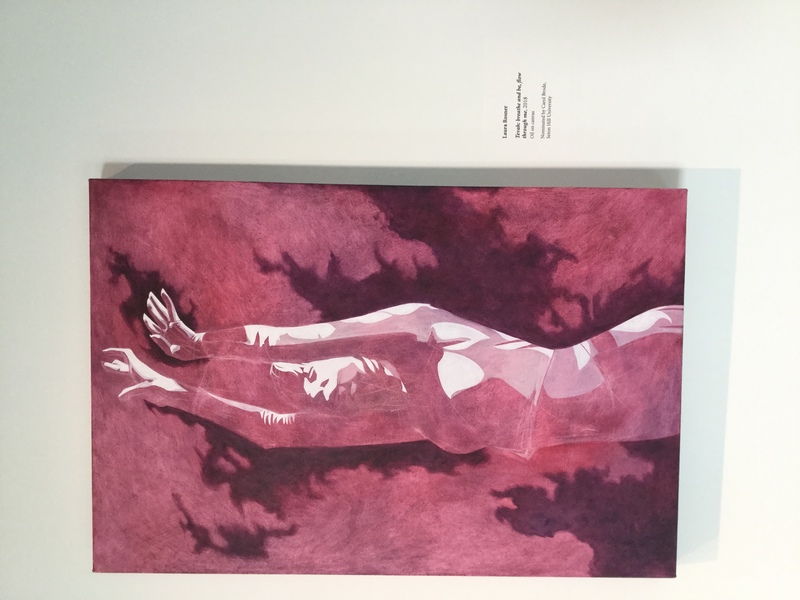 “Tevah: breathe and be, flow through me” by Seton Hill 2018 graduate Laura Rosner is featured at the Westmoreland Museum of American Art. Photo by R.Scassellati/Setonian. This figure refers to the “Artists Who Teach” exhibit, which features the artwork of college professors all across Southwestern Pennsylvania. “I hope that (viewers) will get an understanding of the broad range of art-making in this region,” West said. She mentioned that several well-known artists came from the Pittsburgh area, including Andy Warhol and Sam Rosenberg, and that these professors and students are a continuation of this region’s art tradition. The exhibit greets visitors with artworks ranging from photorealistic paintings to found-object sculptures to computer-generated videos. An unfired clay prism inscribed with the words “WHAT WOULD THE COMMUNITY THINK,” a massive print composed of tiny, hand-written notes, and a wooden robot named “#SelfieBuddy” with a sign encouraging visitors to take pictures with him are among the artworks there. Included in this exhibit is the work of several Seton Hill University professors, including Pati Beachley, Carol Brode, Brian Ferrell, Kenneth Nicholson, Ronald Nigro and David Stanger. Beachley has a trio of sculptures made from metal-cast rope that form commonly-used words with multiple meanings. “The idea that it’s made out of rope (is) like that it’s complicated or bound up in meaning,” Beachley said. A related exhibit, “Students of Artists Who Teach,” opened below the larger gallery Sept. 14. Approximately 150 visitors attended that Friday evening. Each professor of “Artists Who Teach” was asked to nominate an exemplary student of theirs, and then the museum juried these students’ works to select pieces for the exhibit. “I think it’s an honor, definitely, to have a painting in the museum here, especially since this is my hometown,” said SHU graduate Laura Rosner, whose painting “Tevah: breathe and be, flow through me” was chosen for the student exhibit. “Prodigal Son (Jake),” a painting by SHU graduate Paige Tibbe, is also a part of the student exhibit. Rosner was nominated by Carol Brode, and Tibbe was nominated by Stanger. That Friday evening was especially busy because it was also the monthly “Art on Tap” event, when the museum offers visitors alcoholic and nonalcoholic beverages and live music to set a lively mood. “We have the scavenger hunt to engage people and get them up in the galleries during ‘Art on Tap,’” said museum volunteer Rebecca Hagen. This event even manages to draw in visitors with no personal connection to the arts. “Students of Artists Who Teach” will remain on display in the Robertshaw Gallery until Oct. 14. The main exhibit, “Artists Who Teach,” will remain on display in the Cantilever Gallery until Nov. 25 and will host gallery talks on Oct. 10 and Nov. 7.